Has your life ever flashed before you? Sumangali Morhall chased everything Western society taught her to pursue: material wealth, academic success, and even the perfect relationship, only to discover something deeply significant was still missing. A sudden near-death experience opened her eyes, and her life began anew. Left with nothing and nobody to rely on, her inner strength blossomed and her spiritual search began in earnest. Her journey led her to study meditation with Indian spiritual Master, Sri Chinmoy: a direction she could never have imagined. Sumangali reveals the arcane practice of learning from a contemporary Guru in lively detail, shedding light on misconceptions while remaining candid about her own initial doubts. Heartwarming, courageous, and beautifully crafted, this spiritual memoir follows a Western woman learning the ways of the East, and putting them into practice in her modern world: an ordinary person leading an extraordinary life. 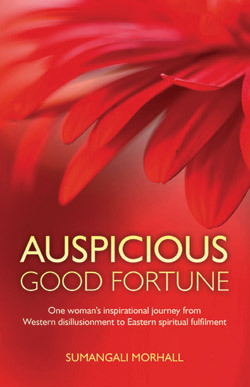 Auspicious Good Fortune speaks to anyone who has asked the question ‘Who am I?’ and who has not been satisfied by an answer based on name, occupation or cultural background. While Sumangali Morhall’s personal journey to happiness leads her to study meditation with Sri Chinmoy, it shows that we each have our own unique route to real satisfaction: it may not be the most obvious one, or the one everyone else is taking. Her story is empowering, offering the reader courage to keep searching for true fulfilment: to think and live outside the box, to climb higher or to swim against the tide if necessary, and above all, never to give up.